It feels like the news is going at 200mph these days, so there’s a lot that we are missing that is falling through the cracks. 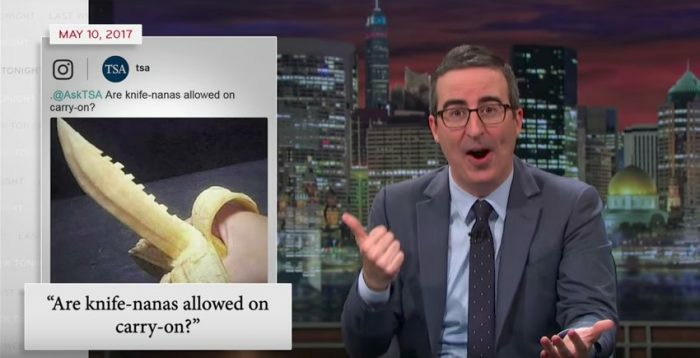 Last night, John Oliver & the Last Week Tonight team meant to devote a large segment of the show to the TSA. Presumably, it was going to be about how the agency fails at pretty much everything it does, all while costing a lot. Instead, Last Week Tonight understandably had to cover an eventful week of life with Donald Trump. They did have three spare minutes in the show, so John Oliver compressed the piece in to this rapid-fire segment. There’s of course a lot of the meat about the TSA missing here, but at least there are penguins. We might be getting force fed the rest of our news through a fire hose these days, but we’ve still got the penguins.